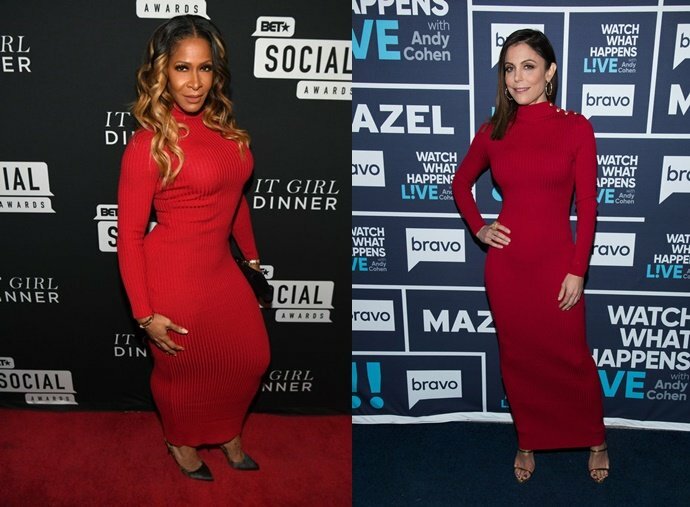 Who knew Sheree Whitfield and Bethenny Frankel had similar fashion sense? The two Bravolebrities were spotted this week wearing the same long red ribbed knit Balmain dress. Bethenny stepped out in her dress first, wearing it on an episode of Watch What Happens Live last week alongside longtime BFF Kyle Richards. Sheree wore hers to attend the BET Social Awards 2018 – It Girls Welcome Dinner in Atlanta over the weekend. Vote below and tell us who you think wore the dress best: Bethenny or Sheree! In case you’re in the market, the dress sells for around $1000. Who Wore It Best: Tamra Judge Or Kandi Burruss – Vote! Tamra Judge and Kandi Burruss have more in common than just being reality stars – they also love the same clothes. The Real Housewives of Atlanta star wore this white dress with cut out shoulders to the celebration of her ESSENCE magazine cover while the Real Housewives of Orange County star Tamra wore it during her appearance on Watch What Happens Live last week. Tell us – which reality star wore it best? Cast your vote below and tell us in the comments why you made that choice. Scheana Marie‘s transition to Kardashian is nearly complete! Reality star show starlet? Check. Mandatory dark hair? Check. Newly shaped/contoured face? Check. Racy scenes on film? Check. Copycat couture? Check check! Vanderpump Rules star Scheana Marie attended the PrettyLittleThing X launch this week and her dress looked familiar because almost exactly one year ago Kim Kardashian wore the same one in black for the 2016 MTV Video Music Awards at Madison Square Garden. Our question is: who wore the look better? Kim K or Scheana Marie? Vote in our poll below! Do you think Scheana’s is a real-deal Galliano or a convincing copy? At least Scheana’s isn’t quite as see-through! Who Wore It Best? Kathy Wakile Or Erika Jayne? Okay, they’re not IDENTICAL dresses, but we are suckers for a good “who wore it best” competition, so here it is! Kathy Wakile stepped out in a black lace up front dress at the RHONJ premiere party earlier this week and Real Housewives of Beverly Hills star Erika Jayne wore a similar dress for her birthday, but with long sleeves and a deeper plunge. So, the big question is: who wore it best? Or even – which style do you like better? Cast your vote below! In our Thursday edition of Who Wore It Best we present you with Kyle Richards attending the Alice Through the Looking Glass premiere this week and Ramona Singer at the Watch What Happens Live studio two weeks ago. Both Real Housewives were photographed wearing the black jumpsuit you see above. We aren’t sure of the designer, but we need your help deciding which of the ladies wore it best! Look them over and tell us below in our poll – who wore it best: Kyle or Ramona? Kim Kardashian stepped out in Paris this week to do some clothes shopping with Kanye West (God help us!). Kim was showing off her high fashion in this long sleeved Balmain dress that looked more suited to fall or winter. Not to mention it had to be a task to take it on and off for trying on clothes. Assuming she does it like the rest of us peasants. Kim is a little behind the times because Kristen Stewart wore this first – only in a different incarnation of the same dress. Kristen wore her crop top version (surprised Kim didn't jump at this one!) to the Snow White & the Huntsman premiere back in June of 2012.
Who do you think wore the dress best? Kim or Kristen? Vote Below! Model and actress Carmen Electra was spotted on the red carpet at the Latin Grammy Awards last month, wearing the same $5,000 Saint Laurent dress as Kim Kardashian wore in her family's "Christmas card". It's not clear who technically wore the dress first, since the Latin Grammy's were in November, around the same time Kim shot that messy monstrosity of a "holiday card". Carmen may want to consider a new stylist so this never, ever happens again! The last thing you want is to follow Kanye's lead on what to wear. TELL US BELOW – WHO WORE THE DRESS BEST? The copycats are at it again?! Teresa Giudice showed up at NY Fashion Week wearing an outfit that looked really familiar! That's because it's the same outfit that Melissa Gorga wore to the taping of Gia's 12th birthday party earlier this year! Maybe it's proof that Teresa IS being frugal, ya'll, by borrowing Melissa's clothes. Unfortunately Melissa didn't lend her the rented red Chanel bag. Take a vote and tell us – Who Wore It Best – Teresa or Melissa?